Let me just start by stating that I am not an evolutionary biologist. 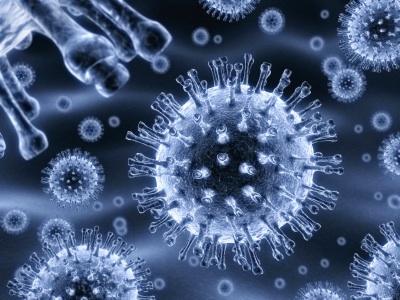 My studies and research are more in cell and molecular biology applied to cancer. So, I apologize in advance for any mistakes I may make in the course of writing this article. However, I should emphasize that I am using, in this article, the same logic and analytical tools that every researcher and scientist uses. There are two phenomena that have been observed in nature: one is observed in physics called entropy, and the other is observed in biology and called evolution. The interaction between the two is of real interest to me and I hope is going to be for you too. Entropy, as part of thermodynamics, is defined as thermodynamic quantity representing the amount of energy in a system that is no longer available for doing mechanical work; “entropy increases as matter and energy in the universe degrade to an ultimate state of inert uniformity”. In other lay words, entropy is describing the phenomenon of decay in the universe from more complex and functional systems into simpler, less functional, chaotic and disorganized states. 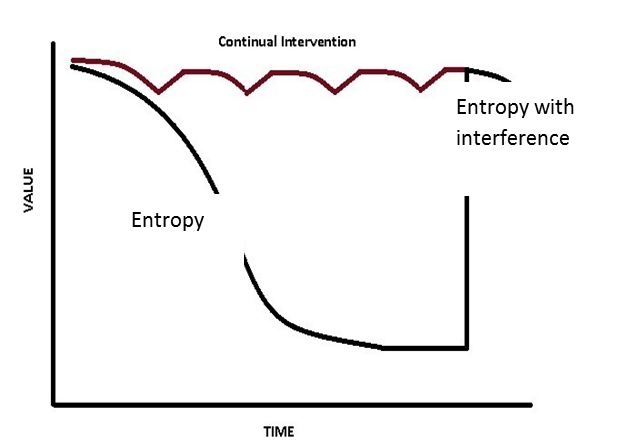 To accurately measure entropy it has to be in a closed system, because once a system is opened to outside influence, it might get infused with more energy and organization that interferes with the decaying process. Entropy is observed almost everywhere from the big universe with its galaxies and stars all the way down to our daily life where decomposition and decay happen everywhere around us. Even at the level of human behavior, we see similar phenomenon. For example, a South African company involved in ERP (Enterprise resource planning) did a study about preventing entropy in ERP applications. Their solution for the entropy seen in teams working on ERP projects was the continual intervention to keep people keen and caring about the project. Yes, they had to open up the system to renovate it. On the other hand, evolution, as a biological theory, is defined as the change in the inherited characteristics of biological populations over successive generations. In simpler words, it is the change in diversity and forms of living organisms through time. Change through time sounds true. Everything changes through time, right! However, how does this change happen? And does it show any trends through time? This is where things unfortunately get political. I will address how the change happens overtime in the coming posts, but this time I will address only the trends of evolution of life through time. The term evolution from the linguistic, non-biological, point means “the gradual development of something, i.e. from a simple to a more complex form”. It is directional from simple to complex. However, from the biology prospective is a bit tricky. Most evolutionary biologists insist that evolution is a neutral, unintentional, completely random and non-directional phenomenon. One of the most famous evolutionists, Stephen Jay Gould (1941-2002), always claimed that evolution is not necessarily a process of increasing complexity. This is where language and biology depart from each other, and evolution in the strictest biological sense becomes completely physical, natural and random. This is happy news for many atheist biologists. If non-directional, it does not require a god to guide it. But does evolution really show no trends or patterns? There may be few examples of decease complexity at the level of certain few species, but does complexity of living organisms not change or even decrease, like the rest of the physical universe, through time? In a recent publication by researchers at Cornell University, Sharov and Gordon report that “genetic complexity … is expected to have grown exponentially” though the ages. This was not the first indication that while life evolved; its complexity has increased exponentially, at both the genetic and the functional levels. Even more interesting, when they used Moore’s law of computer development, which states that the number of transistors on an integrated circuit doubles approximately every two years, they found that life development (evolution) was even faster. When they extrapolated the genetic complexity of organisms back htough time, using Moore’s Law, the time of the origin of life was 9.7 billion years ago, even before the earth existed (fig.2). If we assume, as many atheists do, that our universe is completely contained in a closed system with no supernatural intervention, how then we can explain the evolutionary development of complexity of life so fast in a physically decaying universe? In other words, biological systems increase in complexity through time in a hostile physical universe that tends to lose useful energy and form through time. So many atheist biologists will try to go through descriptive explanations of “negative entropy” and “The Gibbs free energy” to reconcile the two phenomena. In the end, all these descriptive explanations assume that life is exceptional compared to the whole physical universe. Organisms as biological systems have the ability to use free energy to build more complex systems. We can describe the phenomenon mathematically, but we cannot explain why it is different from other non-living systems. When we find a square in the land of circles, describing it does not explain why it is there in the first place. Description is not always an explanation. And If we are willing to consider life systems as open systems that overcome entropic principles, we might as well consider the whole universe as an open system for divine intervention to introduce the force of life. We, believers in the divine, see a new trend in the age of information. It is the “Atheism of the gaps” trend instead of “God of the gaps”. Atheists are facing a dilemma. They’re trying so hard in every field of science to fill up the information gaps by natural physical explanations. However, the more complexity we discover in the universe and especially in biological systems, the more these gaps are likely to be explained with design and intention not by natural means. So, more future discoveries of complexities are going to become harder and harder to be explained away by natural means. The first fruits of this trend can be seen in the conversion of the world-famous atheist Antony Flew to a deist as he mentioned in his book “There is A GOD”. This entry was posted in biology, Christianity, research, science, Theology and tagged biology, Christianity, research, science, Theology. Bookmark the permalink.